Leaving comments during coding is a good way to make a note for the future: it could be an explanation of some part of code, or a reminder to refactor some code, implement additional checks and parts of the logic, or even fix bugs. The Welkin Suite allows you no to keep all these tasks in mind but accomplish them with the help of a special panel. The Task List panel is a great way to track all your important comments in the project and provides you a clear interface to see all of them. To activate it, go to the Main Menu: View ⇒ Tasks List or use the Ctrl+\, T hotkey. Line — a line in the source file where the task is located. Double-click on any of the tasks to immediately navigate to the corresponding line in the code. 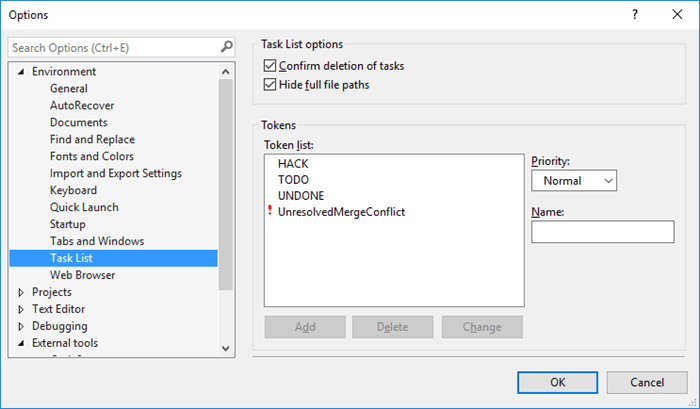 UnresolvedMergeConflicts — indicates some modifications in a code that could not be merged. To use any other token in your comments to highlight important tasks you can easily configure this in the Main Menu: Tools ⇒ Options ⇒ Environment ⇒ Tasks. To add a new token in the Name text box type the text which you will use to identify a task, select a priority and press the Add button. In a similar way, you can modify any existing tokens: select it in the Token List, edit its name and press the Change button or just press Delete if you don't need it anymore. Two more additional settings in the options for your managing your task list are the following: Confirm deletion of tasks and Hide full file paths. By default, both of them are checked, however, if you don't need this — you can disable it exactly here. Another option to add some tasks to your IDE is to switch to the User Tasks in the Task List panel using a dropdown in the top part of the panel. Here you are able to manually create a task with a custom text and priority, however, such tasks won't be linked to a certain line in the code, just to the project itself. Once you complete a task, you can check it in the list and it will remain there completed. You can also delete the completed task with its context menu. User tasks are stored in the project folder in the file with the same name as your project and with the .usertasks extension, so please take this into account if you want to store your project in the Git or other repositories.